Lightly grease a doughnut pan. Preheat the oven to 190C. Mix together all the dry ingredients in a large bowl. Add the remaining doughnut ingredients and mix together well. Pour batter into the doughnut pan and bake for 10-15 minutes or until they spring back when you touch them. Turn out onto a wire rack to cool while you make the icing. To make the icing, put the chocolate, almond milk, coconut oil and vanilla into a heatproof bowl. Melt together over a saucepan of boiling water. Add the Natvia and stir until dissolved. 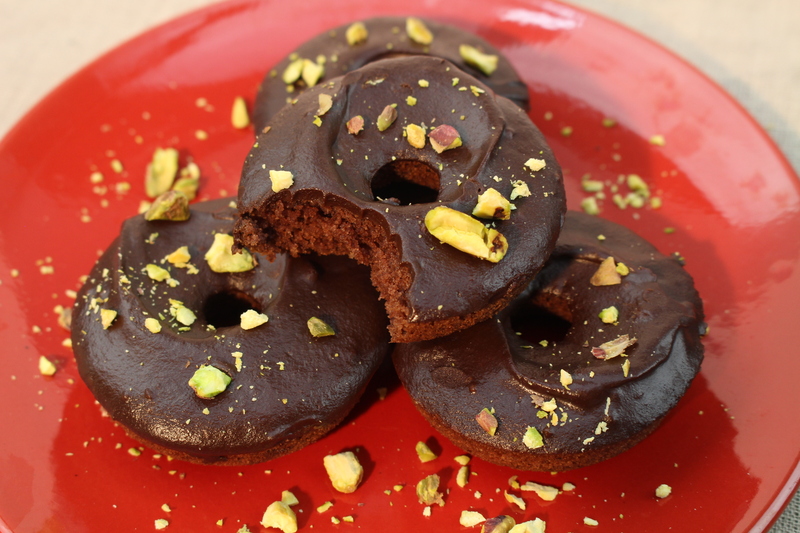 Dip the cooled doughnuts into the icing and sprinkle with coconut or chopped pistachios to serve.